1113 Winchester Trail, Downingtown, Pennsylvania 19383 (US). 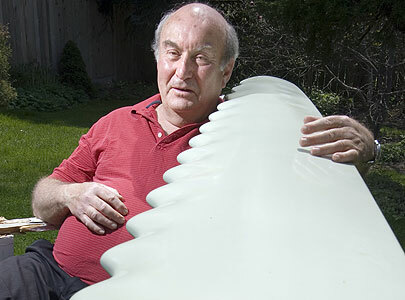 Stephen Dewar, a Toronto executive with startup WhalePower Corp., holds a prototype of the company's blade, which mimics the aerodynamically efficient design of a humpback whale's fin. Humpback flipper may be the key to better wind turbines. They also discovered that the angle of attack of the bump-lined flipper could be 40 per cent steeper than a smooth flipper before reaching "stall" that is, before seeing a dramatic loss in lift and increase in drag. In an airplane scenario, that's typically when you lose control and crash. Dewar says the same aerodynamic principle applies to water flow through hydroelectric turbines â€“ in other words, more electricity can be generated at lower water speeds, making it possible, particularly in a water-rich province like Ontario, to reconsider hydroelectric or pump-storage sites previously thought uneconomic for power generation. But even if WhalePower can prove beyond a doubt that its blade design is better, it doesn't necessarily ensure success. Wind-turbine manufacturers can't keep up with demand for current product, so there's little incentive to dramatically alter the design of their blades â€“ at least not yet. There's also no incentive for banks to lend money to wind-farm projects taking a risk on a new blade design. WhalePower's hope of retrofitting existing turbine blades â€“ an estimated $50 billion worth around the world â€“ could also prove a tough sell. Adler says retrofitting a blade with tubercles would void the warranty. "Who's going to take that chance?" "It takes a while to get any sort of new technology into the marketplace," says Fish, at the same time convinced that the study of biomimicry â€“ the melding of biology and engineering â€“ will help shape the future of energy production, transportation and medicine. Mechanical engineer Laurens Howle with scale model of humpback whale flipper used in wind tunnel. Humpback whale breaching the surface. Note bumpy tubercules on leading edge of flipper. Photo credit: William W. Rossiter, Cetacean Society International. The tests were reported by biomechanicist Frank Fish of West Chester University, Pa., fluid dynamics engineer Laurens Howle of the Pratt School of Engineering at Duke University and David Miklosovic and Mark Murray at the U.S. Naval Academy. They reported their findings in the May 2004 issue of Physics of Fluids, published in advance online on March 15, 2004. “The simultaneous achievement of increased lift and reduced drag results in an increase in aerodynamic efficiency,” Howle explains. As whales move through the water, the tubercles disrupt the line of pressure against the leading edge of the flippers. The row of tubercles sheer the flow of water and redirect it into the scalloped valley between each tubercle, causing swirling vortices that roll up and over the flipper to actually enhance lift properties. “This discovery has potential applications not only to airplane wings but also on the tips of helicopter rotors, airplane propellers and ship rudders,” said Howle. The purpose of the tubercles on the leading edge of humpback whale flippers has been the source of speculation for some time, said Fish. “The idea they improved flipper aerodynamics was so counter to our current doctrine of fluid dynamics, no one had ever analyzed them,” he said. Humpback whales maneuver in the water with surprising agility for 44-foot animals, particularly when they are hunting for food. By exhaling air underwater as they turn in a circle, the whales create a cylindrical wall of bubbles that herd small fish inside. Then they barrel up through the middle of the “bubble net,” mouth open wide, to scoop up their prey. Abstract --- A turbine/compressor comprises at least one magneto-electric device and a drive train coupled to the magneto-electric device. At least one rotor blade is coupled to the drive train. The rotor blade has a shaped leading edge with a series of spaced tubercles formed therealong.